A friend once told me that one of the categories on match.com for “how clean do you keep your house” is “cleans for company”; along with something like “always tidy” and “what’s clean anyway”. I’ve never been able to get that phrase out of my head, I guess, because it was my category. And, when I used to have company more often, my house stayed cleaner. I do like having people over and it is good for me in more than just one way. When I have no laundry, I feel kind of the same as when I have no new email… nothing is pending and I’m not sure what my next move should be. Maybe I was more of a born firefighter or EMT. It’s kind of weird since there really are so many moves that could be or should be made. I’m just not inspired to pick one… there’s no fire. I have an idea though. To make it more fun, I think I’ll make slips of paper with some of the bigger projects in the house and put them in a jar or a bucket then pick a “winner” to work on for 15 minutes. If it gets completed, the paper gets tossed. If it doesn’t get done, the paper goes back into the bucket. How about you? Do you have any projects for your “bucket”? I was at book club last night. I didn’t read the book. I adore, appreciate, and admire the women. That is really why I went. But, I want to read the book too. I used to read the book. Every book. I got into 3 book clubs at one point (admittedly, that got a bit tougher to keep up with). I’ve discovered that as I’ve stopped making time to read, writing has gotten more difficult too. I want that to stop now. I want to read again. I want to write again. And, so I shall. I guess it doesn’t matter where you start, as long as you do. Now where did I put my copy of Mr. Brown Can Moo? Thank you, thank you to Spalon Montage for sponsoring this and a big shout out to Angie Kruse, the stylist that did my cut. It was so fun to do and the gals were so great! Yet suddenly, it seemed, Locks of Love was on my radar again; a gal I know donated hair, a friend’s kid had leukemia, multiple friends were battling cancer themselves, and another gal I know was planning to donate. I ended up checking the regulations again and… no diameter requirement! I’m in. They now also take colored or dyed hair as long as bleach hasn’t been used since bleach apparently causes problems. I suppose I could have just gone to get my hair cut, but it seemed too good a thing not to share if I could and things started falling into place. I found two other girls who were willing to donate which seemed to me a good start for an “event”. I was at Spalon Montage for a Blog Pantry event and when I told the salon manager that we’d like to find a sponsor salon she said, “Let’s do it!”. Love that! So, after some iterations, the date and time have been set — next Monday, March 28 at 10:00 am! Spalon Montage said that they would be able to handle up to 7 people pretty easily, so if anyone else has at least 10 inches of hair to cut and would like to get a sassy, new, short cut from a great salon, let me know soon! I’ll see if we can get you in too. It really is a great cause. Love Spalon Montage, I’m sure I’ll love the new ‘do, and I love that a kid might have a chance to feel a bit better! Today is World Down Syndrome Day. I had a great time celebrating by taking a book that I wrote about my daughter into her classroom to read it to her classmates and teachers. It is a simple book with lots of pictures that I wrote when she was 4. The kids were so sweet as they sat to listen. I read about things that she had been through and how some things are different for her and how some things are very much the same. The kids almost unanimously liked all the things my daughter liked in the book. 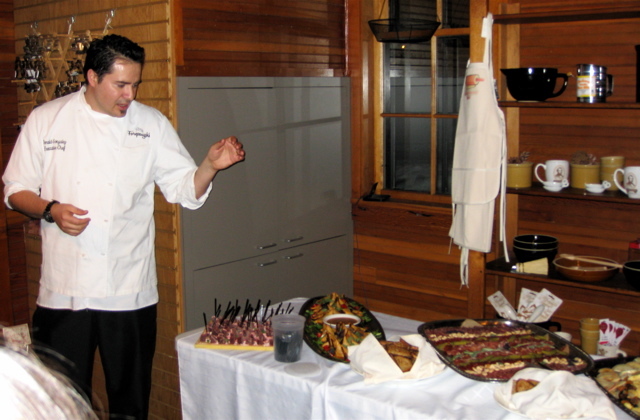 It was fun to share. At the end, I asked if there were any questions and nearly all of the questions were about how I had put the book together. One boy even wanted to know if I had drawn the pictures (they were all photos). Down syndrome was clearly a secondary thing. I had been told by another mom that this was how it went for her too so I actually wasn’t surprised. I think kids just like the idea of putting a book together to tell a story. In the book, I explain somewhat what Down syndrome is (at a young kid level). Even so, there was another question. A boy asked at the end, “So, what’s Down syndrome?”. I love that her classmates don’t have this “label” for her and I also love that today, they learned the term. Kids are smart and I think it is good for them to have words for their observations. I tried to express to the boy that it is kind of hard to explain exactly what Down syndrome is and I asked him how he would explain to someone what “brown hair” is, what it means to be born with brown hair. He kind of chuckled and seemed to realize what a task that would be. I just briefly mentioned that Down syndrome leads to some of the characteristics that I had previously talked about such as that she has to work her muscles really hard (hypotonia), she has to practice things more, and she might look a little different. My daughter’s teacher then had a great question for the class too. She asked if anyone learned something new or found out something interesting that they’d like to share. And, the class was back to the pictures as a girl said that she thought “It was very interesting to see, um, the picture of her at the beach. It was a very cute picture.”. I was glad that I had brought in a spare copy of the book with the pages all loose and I passed the pages out and the kids all got a chance to look at the pictures more closely. They were great at sharing and asking for a page to be passed that they hadn’t seen and they made such sweet comments about what they saw. My daughter was even in the mix with her classmates passing pictures of herself and looking at them again. I am grateful to feel like my daughter is in a good place. She’s just one of the kids in her class. I hope you had a great World Down Syndrome Day too. I have no good words to describe the look on girl 2’s face. It was a combination of shock, sadness, anger, hurt, and a glimmer of just wanting to flee. I took it as an opportunity to “practice” what I planned to tell my kids when this day came for them. I’ve never bought the “sticks and stones” theory. So I tried something else. I told both of the girls that just because someone says something, that doesn’t make it true and they do NOT have to choose to give it even a second thought. I asked the girls what they would say if someone told them that the sky was purple. They looked at me confused so I offered that they might think that the person was just wrong and that the whole idea was silly. I wanted them to see the word “mean” as wrong and just plain silly. Please, please, please girls, don’t give it a second thought because it is as wrong as saying the sky is always purple. If you know something is just plain wrong, you don’t have to let it in. Water off a duck and all that. I hope girl 2 lets it go and isn’t bothered and I hope my kids will let it go when it is their turn. It is hard though. I think I prefer the “if you haven’t got anything nice to say, don’t say anything at all” plan. 100 books, good reading or road? So, the project for “I like to read” month has come to a conclusion. 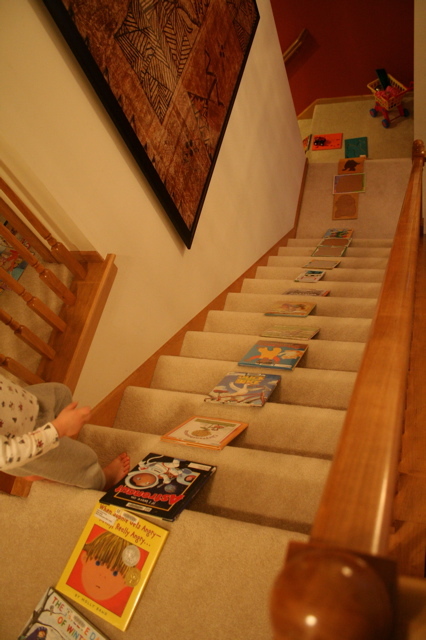 My kids and I set out to read 100 books in the month of February. It went really well. I didn’t write down every book we read, but I did write down at least 100. I’m actually glad to have a number (I’m a geek, I like numbers) for how much we read. I wouldn’t have guessed quite that much, but it is good to know that we’re getting in some good stuff. Having so many fun books (old and new) around got pretty interesting too. 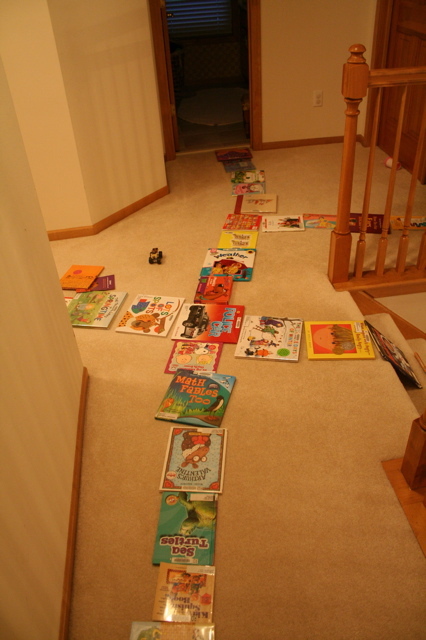 The kids decided to make a “road” out of the books for monster trucks to drive on. The “road” got a bit rough on the “mountain” (otherwise known as the stairs) and was quite long, going into each of their bedrooms. I liked how creative (and careful, since that’s a big rule) they were with the books as “material”. I also liked reading so many different books and spending time reviewing the coins and the math involved in the coin count. It was a fun project to do and we got to a lot of fun books… from simple ones like “Hello, Puppy” to more lengthy tomes like “Cars and Trucks and Things That Go”. We’re still working on what we’d like to do with our 100 coins. The brainstorming session involved dolls, puppies, mailboxes, and more. Did you get some reading done last month? What would you do with 100 coins?